More Monsters. Deadlier Demons. Same Stan. In an all-new Season 2 trailer of IFC's Stan Against Evil, unveiled at Comic-Con International: San Diego today, fans can catch a glimpse of the demonic creatures, animals and ex-husbands heading to the quaint town of Willard's Mill this November. The new season picks up where the Season 1 finale cliffhanger left off, with Sheriff Evie Barret (Varney) stranded in the year 1692, accused of being a witch and about to be burned at the stake. Season 2 picks up again in Willard's Mill, the small New England town where Stan Miller must begrudgingly get off his couch to solve the mystery of Sheriff Barret (Janet Varney)'s time-travelling disappearance. Through thick and thin, the unlikely team continues to battle against the unleashing of wicked demons trying to take over their town, which happens to be built on the site of a massive 17th century witch burning. Guest stars for Stan Against Evil Season 2 include Denise Boutte (Meet The Browns) as Lara Bouchard, a local who may know more about the town's demonic creatures than she lets on. Jeffrey Combs (Gotham) also plays as the Impish Man, a Willard's Mill newcomer who loves nothing more than a good bet. 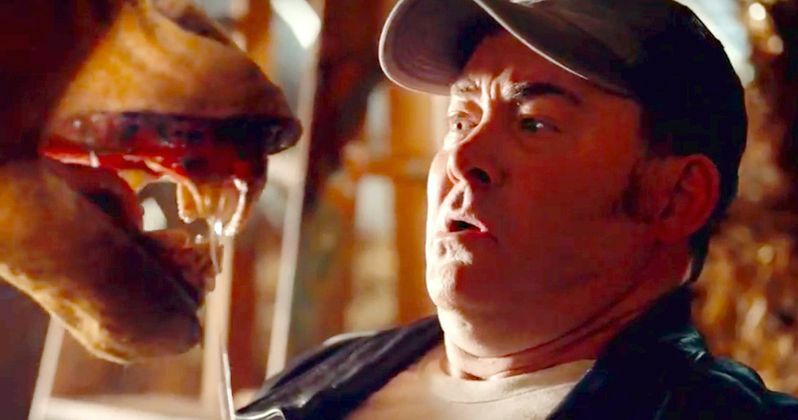 David Koechner (Anchorman) portrays Kenny, Evie's incorrigible ex-husband who, to Evie's dismay, creates a friendship with Stan. Steven Ogg (The Walking Dead) as Rusty, a cowboy from the past who takes a particular liking to Evie. The final guest star for this season is Patty McCormack (The Bad Seed) as Priscilla, the knowledgeable owner of an antiques store. Stan Against Evil is created, written and executive produced by Dana Gould (The Simpsons, Parks and Recreation), with Tom Lassally (Silicon Valley) also serving as executive producer. RadicalMedia (What Happened, Miss Simone?, MARS) produces the series with Frank Scherma and Justin Wilkes executive producing. Star John C. McGinley also serves as a producer. Deborah Baker Jr. (The Great Indoors) and Nate Mooney (It's Always Sunny in Philadelphia) also return to co-star as Denise Miller, Stan's absent-minded, do-good daughter, and Deputy Leon Drinkwater, Evie's right hand man, respectively. The Stan Against Evil season premiere airs Wednesday, November 1 at 10 PM on IFC. The 8-episode second season will air weekly on Wednesdays with two episodes back-to-back at 10 PM and 10:30PM. Starting Friday, August 18, fans can exclusively catch-up on Season 1 of Stan Against Evil only on Hulu. Take a look at the new trailer for Stan Against Evil Season 2 below.